We’ve updated our standard switching for 5-Way with 3 Pickups and 2 Knob guitars. See the in-depth instructions above. We’ll be adding instructions for all our Switching options to the Electronics page soon. Our friend and photog Peter Kappen of @kappenphotography came by the shop and took some fun shots, which we'll be sharing over the next couple weeks. Keep an eye here and on our Instagram for more! Aged finishes have been in demand for several years now but, as with everything here at Anderson Guitarworks, we wanted to wait until we could do them just right. That time has come and we are pleased to offer the worn-in look with zero compromises to flawless performance. We call them "In-Distress" finishes. In-Distress "nitro" finishes are available on select guitar models in a wide array of vintage colors and include aged hardware and appointments. Please see Spec Your Guitar to explore the options in depth! Even More Fun - Day 3 of the 2018 NAMM Show! Come on in our booth and enjoy, let us show you more. Featuring, what has become, a extremely-popular pickup configuration of Soapbar in the neck position and Humbucker at the bridge. With the right switching (which Cobra has, of course) this can be a very versatile layout, yielding quite an array of super-enjoyable sounds. Cobra’s mahogany-powered muscle will be arriving at Make’n Music right after the show. Stopping traffic in the aisles with its unique S-pickguard atop a T-body shape (hence the name, Mongrel—a mix). Its stunning Flame Maple Top is finished in the lush shade of Honey (burst) Surf. Have it all in one guitar. On its way to Northwest Guitars in Bellevue, Washington, for one of their fantastic customers. In Cajun Teal has Carved Top, Single Cut players in pure bliss. Boundless bending and silly in-tune performance as musical humbuckers roar to life, supported and enhanced with Bobcat’s short-scale, Mahogany voice. Music Zoo will see “Robert” in person soon after the NAMM Show. Could it look any more like the ocean’s currents without actually jumping in with board shorts? Gorgeous 24 fret guitar and the majesty of nature. Headed to Cosmo Music in Toronto, Canada right after surfing at NAMM. Could anything be better than giant Quilted Maple with Natural Orange Burst? Especially when you know beyond a shadow of a doubt you are playing the best guitar on…Earth. And speaking of Earth, this guitar is headed to Eddie’s Guitar in Maplewood, Missouri, U.S.A., Planet Earth (that’s your planet). Stay tuned for more from Namm 2018! And the Anderson Fun Continues at the 2018 NAMM Show, welcome back. Come on in and hang out with us! So... what’s with the two old Andersons in the Booth? I thought the NAMM show was all about what’s new? Well they may look perfectly old but these two guitars are actually showing off our new/old “In-Distress” finishes. Arrayed in a Seafoam Green finish that is “In-Distress"—nicely worn. But make no mistake this Icon performs with full Anderson magnificence in every area. And…check out the amp Mesa made to complement. Both headed to The Guitar Sanctuary in McKinney TX. Want to talk about a guitar with attitude? This is it! And of course, Anderson’s superior playing prowess is available to you in every ounce of this T-Icon’s essence. Headed to Sound Pure in Durham North Carolina. 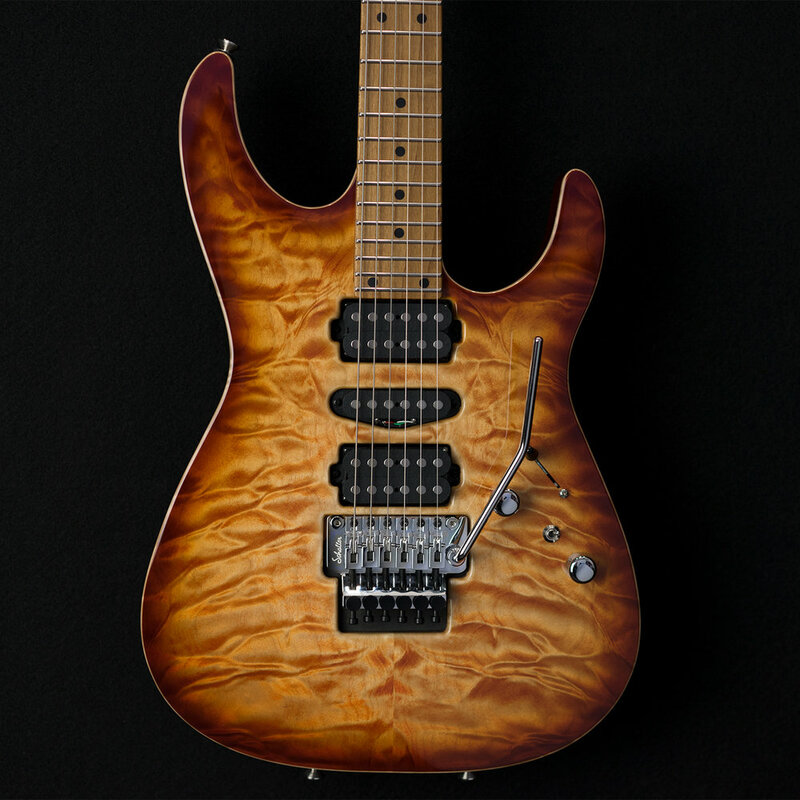 Radiating from this Drop Top Classic’s stellar Quilted Maple Top, literally (not merely figuratively) has people stopping in their tracks to exclaim over its beauty and warmth. This was probably Laurie’s favorite guitar finish and Eddie’s Guitars and Anderson chose this shade for NAMM in honor of her deep caring for all of us. Do we miss her? Yes, we do! With our very popular “Recessed Floating Tremolo” bridge and dramatic Ziricote Fingerboard, this Drop Top is warming hearts with its utter coolness—both in color and performance. This one headed to Matt’s Music—a really fantastic store in the Boston area. First up Superbird—gorgeous, fit and properly-sized Offset body with an all-Mahogany superstructure—both body and neck back—and 24 3/4-inch scale length, make this guitar naturally crank out aggressive midrange muscle. TV Yellow finish highlights its Mahogany body. Want to touch it? Contact Distinctive Guitars in Milwaukee, Wisconsin. Finished in Ruby Slippers and “killer.” Everyone loves it! And the new Anderson J-Trem plays with excellence: Silly In-Tune Tremolo Function, Fantastic Intonation, Precisely Adjustable String-to-Fingerboard Radius, Tremolo Arm Tension Rotation is Easily Adjustable. And…also headed to McKinney Texas and The Guitar Sanctuary. That's it for now, but stay tuned for Day 3! Welcome to the Anderson Guitarworks booth at the 2018 NAMM Show! Come on in and hang out with us! And speaking of hanging, we have the most luscious Anderson Guitars that you have ever laid NAMM Show-eyes on, hanging around in our booth. Anderson now offers only Private Reserve Koa for it’s Koa-topped guitars, and you can certainly see why...and Koa-lovers love it. This one will be on its way to Northeast Music Center once it has made everyone here at NAMM silly-happy. Super-power 24 fret Master with a gorgeous maple top in combination with time-honored pickguard styling—hence the name, “Guardian” Angel. This one complemented with a Caramel Maple neck and crowned with a custom Red Logo. This is a color that our beloved friend and business partner, Laurie, appropriately named and it has been a favorite ever since. Laurie left us late last year and yes we miss her a lot but feel her loving and generous spirit with us everyday—still here. This one was chosen by Make’n Music in Chicago for its style…and for its sweet color. Yes, the already-legendary T Icon is at NAMM. Although many like to pronounce it: Tie Con as all one word—for fun. Ticon. You may say it either way. This one finished in Transparent Brown over a Swamp Ash Body and a Chocolate Maple Neck—gives the look of an all-rosewood T, but with Ash/Maple tonalities. Leaning on a Mark Five: 35 in Surf Green, that was custom made for this Show by Mesa, the guitar will go to Mass Street Music and the amp to The Guitar Sanctuary—to blend with another Anderson Guitar yet to be seen. 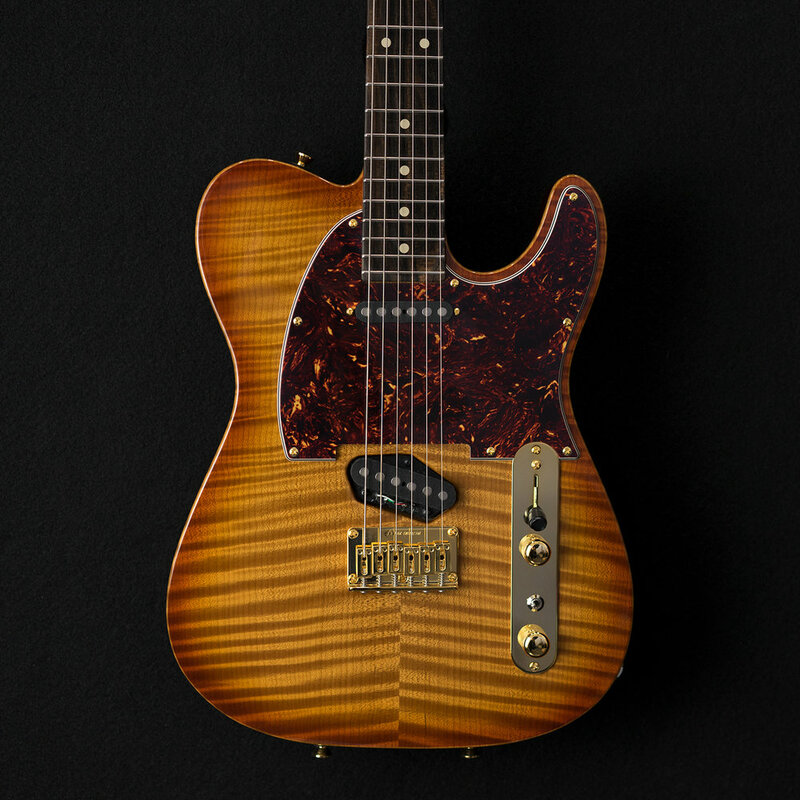 At last you can see what a Caramel Maple Top really looks like topping a Top T Classic body. This is its natural coloration and naturally dramatic flame. Only the edges of the body are shaded with a light Transparent Honey. Jammin’ his Anderson as a crowd gathered. 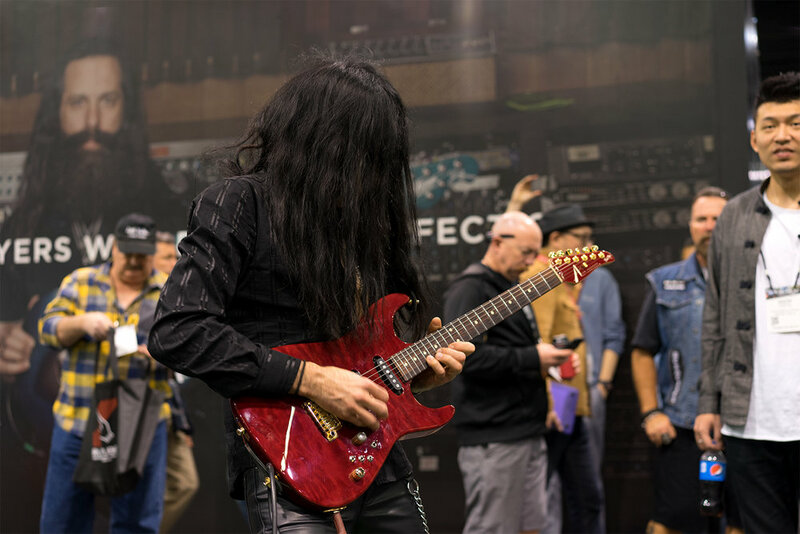 Smooth and flowing legato runs at speed made for an impressing NAMM Performance that left those watching and enjoying in elation. Stay tuned for Day 2 of NAMM 2018! Happy New Years! We wish you all the best in the coming year. 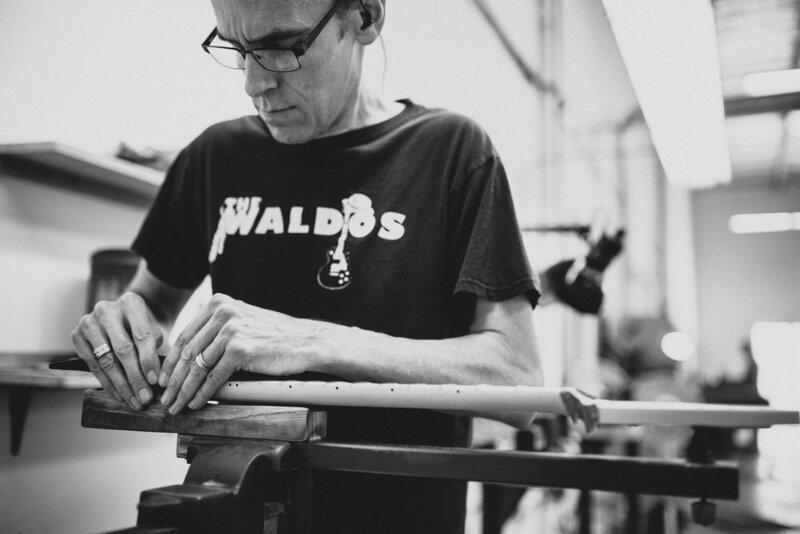 What's new at Anderson Guitarworks? Well, here's a few things for now, but stay tuned - much more to come! A more traditional refinement of our T-Classic. With an Anderson-modified Vintage T-Style bridge, traditional pickguard trim, 3-Way layout, solid or hollow body chambers, and more. A popular addition to our hardware options, this Anderson-modified bridge features slick low-profile, locking saddles,and is available on most models. Floating is fun! We'll be moving upstairs at NAMM this year - come see us at Booth 5226 in Hall D - we'll have a surprise or two! We've added a Register Your Guitar feature - click here or look under the Support tab for more info.